Bakery Style Strawberry Muffins are sweet, moist, and big strawberry muffins topped with a delicious cinnamon streusel crumb topping. These strawberry muffins turned out perfectly. The muffins are packed full of the perfect strawberry flavor, and are perfect for breakfast, brunch, or a snack later in the day. These strawberry muffins are a perfect way to use up some strawberries, whether fresh from the garden or when you buy a big basket from the store. The muffins aren’t extra sweet, but just the right amount of sweetness. And the crumb topping adds the perfect bursts of sweet on top. The crumb topping on these muffins is seriously divine. I could just eat it plain – its that good! The muffins are like a mix of muffins and coffee cake, because of the streusel crumb on top. They’re one of my favorite ways to start the day! 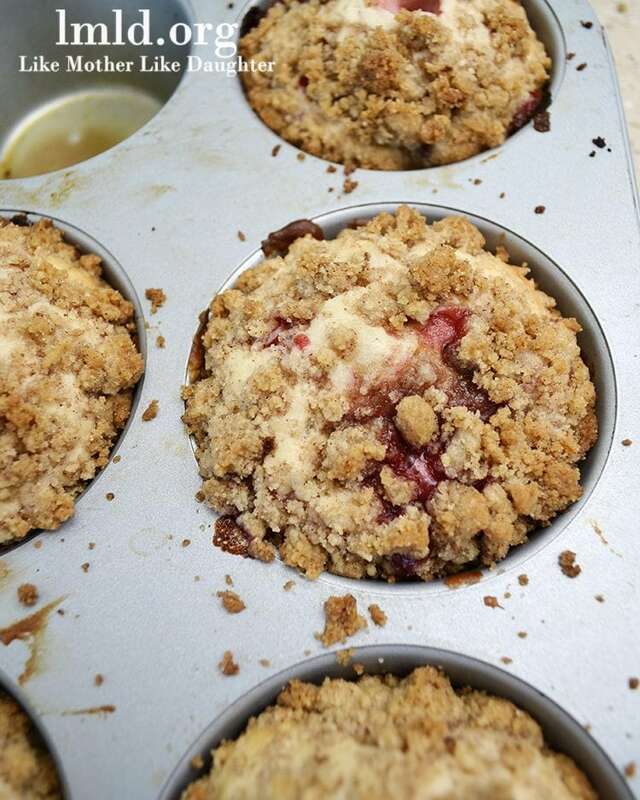 These are adapted from this strawberry muffin recipe on Real Mom Kitchen. Combine the butter and sugar for your muffins in a large mixing bowl. Mix in the eggs, one at a time, until combined. Combine the baking powder, salt and flour in a medium sized bowl. Alternate adding the flour mixture and the milk until everything is incorporated and mixed well. Pour the batter into muffin tins evenly. In a small bowl combine all the ingredients for the crumb topping until mixed well, using a fork. Sprinkle the crumb evenly over the tops of the muffin batter. These are best eaten fresh or within 1 to 2 days because the crumb doesnt stay crisp. Berry Good Recipe! I used 1 cup of strawberries and 1 cup of pomegranate seeds and added 1/2 cup of white chocolate chips and the’re amazing. has anyone used tinned straelwberrys ? I’m so glad you liked them, Sloane! These are some of my favorites! These are great, I used granola instead of the crumbs and they lasted longer and are delicious as well! Oooh granola on top sounds delicious! These were delicious! I made mine into a loaf and for the crumble i noticed for me anyways it was best to add the butter in little by little.., my first batch became a paste. Thanks for the great recipe! Glad you figured out what worked for you Cristina! It sounds delicious as a sweet bread loaf! Thanks for sharing this recipe! Strawberries just went on sale for $1.25 a package at my local grocery store, so I stocked up on them. I have the first batch in the oven right now, and it smells heavenly! Oooh what a great price for strawberries. Hope you stoked up! Also hope you like the muffins! How do you think these would freeze? I have a ton of strawberries to use up, and I live alone, with my boyfriend visiting on the weekends. I could always bring them to work, if need be. I haven’t tried freezing them, so I can’t say for sure. But I think they would freeze alright. However, the crumb may get a little moist in the freezer and might not be as “crumbly” when thawed, but I think the flavor would still be there. Let me know if you try it! Thanks Katie! It was my first time with strawberry muffins, but they turned out so good I will definitely be making them again! Thank you Audra! Let me know if you try them!